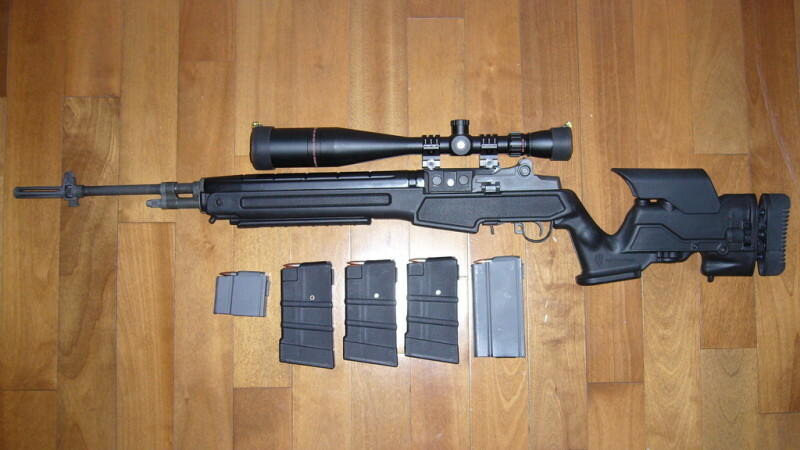 Starting with an american-made precision stock called “Promag Archangel M1A Precision“. 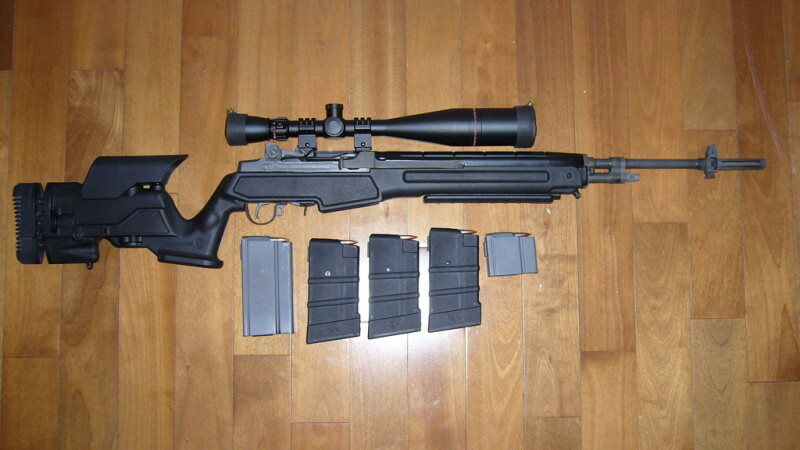 The Archangel stock was originally made to fit a Springfield Armory M1A but only little adjustments had to be made to fit the chinese Norinco M14S. With the help from M14Doctor on Canadian Gun Nutz, I’ve followed every steps he made, to make this rifle fit in the stock. Took me around an hour to fit correctly without goofing around and it fitted flawlessly! It’s nice and tight! Stock is adjustable in lenght (shoulder pad) and in height (cheek riser) with some tight 0.5 inch increments with the turn of a knob. 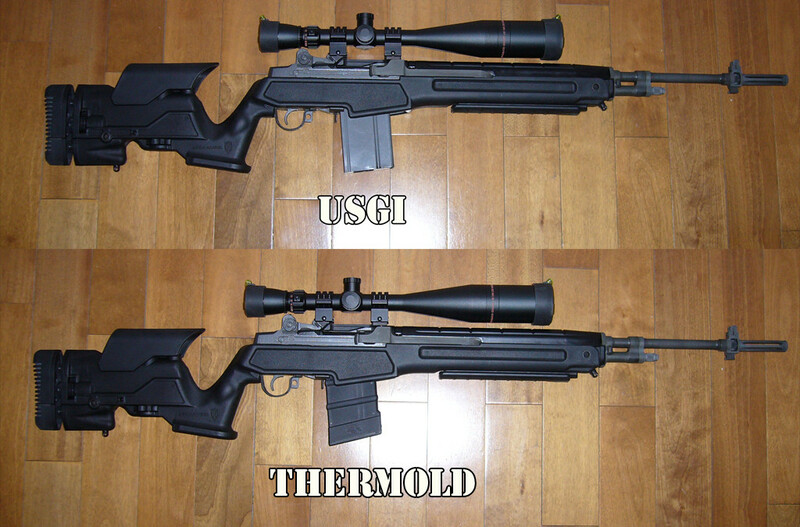 Also have some nice features like at the bottom of the stock, there is a place to fit the web of the left hand so you can push the rifle in your shoulder. It also have 2 swivel studs to install a sling and finally have a full picatinny rail at the 6 o’clock position of the stock to fit a bipod! This really helps to fit every shooters’ size, also to get a good eye-relief and a consistant accuracy! Also from Mystic Precision, I bought a really good scope with a mildot reticle. It’s from the reknown company Sightron. Model is SIIB SS 6.5-20×50 Mildot. I think this scope glass fits in the Nightforce/Leupold league, but without the price tag… It cost around 690$ CAD and I must tell you it worth every dollar! It’s the best bang for the buck I’ve paid for a long time! Good price for a nice quality scope! Finally, I’ve decided to go with some Weaver 6 bolts tactical 1″ rings. These are the X-High model. They hang on tight to the rails!